The composition of silk cocoons is very similar to skin proteins. Indeed, silk contains 12 amino acids which are useful for all skin types, of all ages. These cocoons allow therefore a totally natural exfoliation, cleansing, moisturizing and firming effect when you rub it on your face. Before you wonder how you could possibly rub that little dry and rough shell on your skin, be sure to soak it in hot water for 2 ~ 3 minutes. Once softened, insert your finger in and massage your skin with circular motions. Each cocoon can be used 4 ~ 5 times. You just have to make sure to rinse them properly, dry them and keep them in a hygienic place. Don’t forget to let them soak in boiling water before use to remove any possible bacteria that could fit there. You should know that skin cells renew every 30 days : This is the time for cells to reach the surface of the skin: So I used these cocoons for 1 whole month, and I found that my skin texture was definitely more smooth and firm. I have not seen any drastic moisture nor improvement on my sebaceous filaments, but exfoliation is clearly and immediately distinguishable, even more if you gently massage the cocoon on your lips, for example: They come out softer than ever! In a nutshell, it’s a cool gadget. 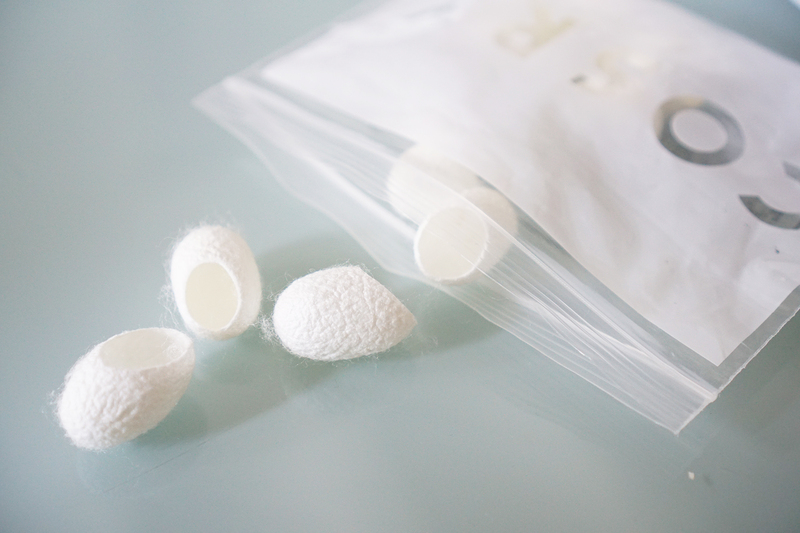 You can buy a set of 12 silk cocoons from the Korean brand COSRX on Fleurs du Japon for only € 5.90 ~ Give it a try, ok? Skin & Lab Dr. Tightening Pore Glacial Clay: The facial mask you’ve been waiting for! Je note les “jolis” termes de filaments sébacés au lieu d’un autre terme :p (avec lesquels je galère en plus).